This was a tough post to get going. I've been panic-stricken since Friday, racking my brain over what to write about. It's tough, you know, being as conscientious as I am. I know my readers expect high quality writing on issues of the day; issues that have an impact on their every day lives. And I know it's my job to deliver relevant, thought-provoking pieces. So I was particularly grateful as I perused the Drudge Report yesterday and I came across two articles, side-by-each that cried out to be written about. Because to my way of thinking the question posed by the first was answered by the second. Talk about serendipity. Well, I wasn't actually. But now that you mention it. The first article told of an American government-funded research project to study...wait for it... cow burps. You can see how this caught my interest. You see, to my mind at least, cows get a bad rap. Their farts always get blamed for hiking up the atmosphere's greenhouse gases - literally. 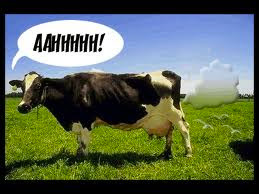 But you see, according to a bunch of New Hampshire scientists cows emit most of their methane through their belching. Huh. Imagine that. You don't want to light a match around our cow compadres. Now the second article I came across helped explain, to my mind at least, the worst that might happen if bovine burps are left unchecked. It seems NASA has discovered balls of fire in the skies over eastern Canada and several U.S. states. Apparently there are several theories about what the cause of those fireballs. NASA says it may have been a meteor, but I know differently. They were due to cow burps. And now you know too! You're thanks is not necessary. It's just what I do. Did you find this to be a moo-ving story or udderly ridiculous? This is the best post about cow burps I've read all week. Now I'm off to google "atmospheric cow burps on fire." Were you watching Fatal Attraction on Animal Planet? It was about bovine attacks! And now I read this? Ziva: It's early yet. It's only Monday. UR: Heh, heh, I'll take that as a compliment. Fatal Attraction on Animal Planet? Wasn't that my post last week about the guy who screwed the donkey? I feel your pain brother. The Irish Government last year spent €125,000 counting the amount of frogs in the country! I kid you not. Thank you for this wealth of important information. I really had no idea that cow's burping was this kind of issue. But now that I know, I'm going to avoid eating grass and/or hay or whatever it is that cows eat. Linda: That's great LM> We all have to do our fart, erm, ah, part. Dufus, I can always cownt on you to keep me informed. Nicky: I'm glad you cud depend on me. Seriously? Panic-stricken since last Friday? Dude, relax. KABLOOEY: Thanks. I needed that. I always feel sorry for the cows... they do have four stomachs. I'd like to know if you've ever seen a report about the damage done by human farts and burps. Anji, some of the human farts and burps I've been unfortunate to be around have been pretty bad, so I'm sure they are as destructive as the cows, if not more so due to the volume of people out there. Well, that explains that mystery! Anji: I haven't seen a report on human fats and burps. But my wife tells me they're pretty bad for our home environment. Don: I haven't had the pleasure to experience a cow fart. But if it's worse than mine...oh boy. Boom Boom: Mystery solved! I wonder if cows eat brussel sprouts.